An explosion rocked the red city of Marrakech earlier today. The blast occurred around 11:30am local time at Argana Café right at the heart of the bustling and colorful Jama'a el Fna Square. The café and its famed terrace serve as a popular hangout spot for tourists and locals. The early tally of casualties reveals 14 dead and some 20 injured (see latest photos here or here). 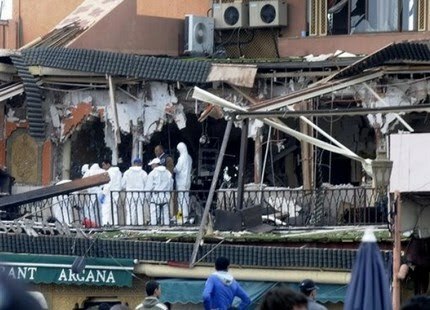 This is the second terrorist attack in Marrakech after the 1994 Atlas Asni hotel assault. For the first time in its long history, the fabled Jama'a el Fna Square is sad and empty tonight. Instead of the nightly festival of soothsayers, storytellers, mobile restaurants, singers and dancers, the square is a zone for investigative squads. It is early to lay blame on any particular entity and I don't want to revel in conspiracy theories or premature analysis. Many have pointed the finger at militant Islamists, Algeria and the Polisario, but none of that is constructive at this point and is simply too early to ascertain. One thing is known so far is that the blast was a criminal act that sought to wreak chaos and fear in the hearts of tourists and Moroccans alike. In a city and country dependent on the tourism industry, this definitely deals a major blow to the Moroccan economy. Today's tragic event transpires amidst a defining time for Morocco. Over the last couple of months, protesters have taken to the streets demanding greater political and socio-economic reforms. The king seemingly open to meaningful reforms promised constitutional revisions. There has been a general atmosphere of openness and proclivity towards dialogue. The Marrakech bombing couldn't have come at a worse time. This could potentially derail or delay the pace of reforms. One can certainly hope the blast would be an impetus to launch far reaching and systemic reforms in the face of whatever entity that seeks to tarnish the current national dialogue about the future trajectory of the kingdom. My heart goes out to those affected by this tragic act of cowardice. Tonight I have my home city of Marrakech in my prayers and thoughts.